Janice B. Miller is serving her third term on City Council. Miller served her first term on City Council from 1992-94, and was elected for her second term in 2014. Miller serves on numerous regional boards, including the Metropolitan Washington Council of Governments Human Services & Public Safety Policy Committee and the Virginia Municipal League Human Development and Education Committee. 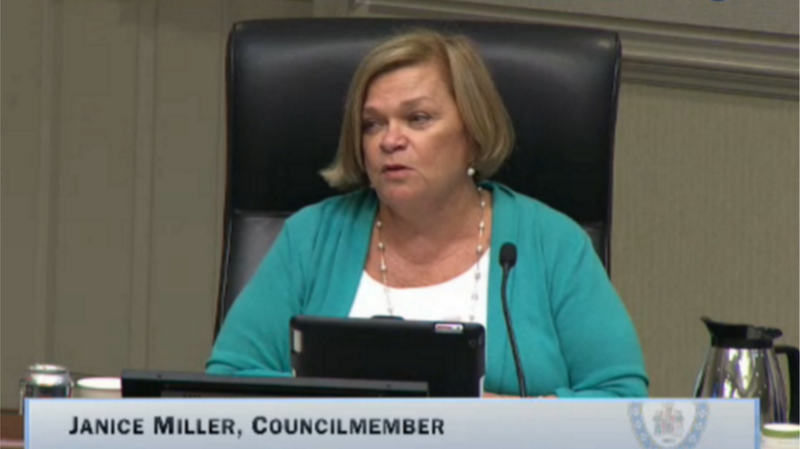 Miller was first appointed to the School Board in 1977 and she served 11 years as an appointed member. During her 30-year tenure on the board, she was an active leader both as board chairman and vice chair. She also provided leadership to both School Bond Committees that supported additions and renovations to our four city school facilities. Miller has served as the secretary for the Friends of Fairfax and as a member of the Virginia School Board Association (VSBA). She is a member of Historic Fairfax City, Inc. and Historic Fairfax Neighborhood Association. Previously, she represented the School Board as a member of the City’s Park and Recreation Advisory Board. She has been active in local PTAs and youth organizations, serving as the first woman president of Fairfax Little League and assisting in organizing activities for FPYC. She was a founding member of Northern Virginia Project Graduation and she initiated Fairfax High School’s All Night Grad Celebration and organized the graduation night event for the Fairfax High Classes of 1988, 1989 and 1994. She is a past chairman and member of the Board of Directors for the Chocolate Lovers Festival Committee. Miller, a graduate of the University of Kansas, is a former middle school teacher. She works as a travel consultant for The Travel Gals, a virtual travel agency. A resident of the City of Fairfax since 1970, Miller has four children and four grandchildren.